On Saturday afternoon I attended my very first A-League game, the encounter between Sydney FC and the Newcastle Jets, headlined by the presence of international stars Alessandro Del Piero and Emile Heskey. Football, or soccer as I still occasionally call it, is not my first love. Let me be upfront and honest about that straight away. It’s not that I hate the game, it’s just that I have basketball in my blood, am a self-confessed cricket tragic, love both rugby codes, and enjoy AFL. That doesn’t leave a lot of time to dedicate to other sports, especially when a pesky job is thrown into the mix. Oh, and a wife. As such, despite playing the game in my youth, I’ve never gotten ‘into’ football, let alone the A-League. Sure, my geographical allegiance means I hope and want Sydney FC to do well. And the fact my best mate’s brother is assistant coach at the Central Coast Mariners ensures I have a soft spot for that club. But, otherwise, my interest in the A-League is limited to watching highlights and knowing who won the competition. However, the allure of watching Del Piero and Heskey proved too great to resist, even for this non-believer. So I attended the match on Saturday, arriving at the game via the greatest transport of all: the bandwagon. Even to this untrained eye, Del Piero is a genius. His command of the game is amazing, and it’s clear he’s a few steps ahead of everyone else, especially his teammates. Whether his new friends lack his class, or there is unfamiliarity that may improve later, several times his deft passes were too good for his teammates. But the man is clearly a footballing freak, and that’s without even taking into account his magnificent goal from a free-kick. For our rugby league and rugby union fans, the perfect analogies or comparisons for Del Piero at this stage of his career are Jason Smith, Cliffy Lyons or David Knox; he may not be quick anymore, but he has superb skills, patience, vision and class. He was a joy to watch. Heskey was just as impressive as Del Piero. Perhaps even more so. 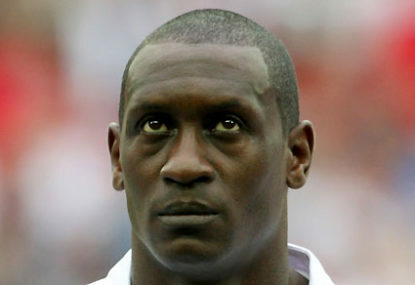 If I’m honest, Heskey was a bigger drawcard for getting me to the game than Del Piero, as I have watched him play many times for England, and had un-affectionately nicknamed him ‘The Slug’. However, it would have been inappropriate to yell that at him, for several reasons, but primarily because it’s clear he is not here for a holiday. He looks fitter than I’ve ever seen him, and his hustle and effort was top notch. He also seems, at this stage, to be in greater sync with his teammates than Del Piero, and it’s safe to say he’s going to have a great season. Loud, passionate, knowledgeable, appreciative and, most importantly for the A-League, large. 35,419 people packed out the stadium and made it one of the greatest sporting atmospheres I’ve ever experienced. A special mention goes to The Cove, who make other sports’ fans look positively pedestrian. On more than one occasion, a Sydney FC defender left an attacking player who actually had possession of the ball. It was bizarre to witness, and enabled a strike on goal or an un-pressured cross to a teammate. I’ll allow more experienced football fans to comment in more detail, but I would guess the Sky Blues will be working on their defence at training this week. I had never heard of Craig Goodwin, but after 20 minutes I said to my friend, “That blonde guy is good.” Not the most insightful analysis, I grant you, but the Jets player caught the eye early and often. I had to ask the fan beside who he was, and I then googled him. The fact I did both should give you an indication that he stood out. And now I know he’s just 20 years old, I would suggest it is a name we’re going to hear a lot of in the future. That headline is probably the runaway winner for the ‘most obvious comment’ award for 2012, but the importance of marquee players needs to be stressed. Far and beyond their talent, it’s their star power that gets people through the gates, with yours truly as the prime example. We’ve see the impact it has had on the A-League this year, and cricket’s Big Bash provides another case study for how international stars can generate interest for a fledging competition. Other sports, in particular basketball, can learn from the A-League. It’s also interesting that Tim Horan says Super Rugby clubs should be taking note. Marquee players generate added interest, which generates additional revenue, which can be spent on recruiting even more marquee players. More marquee players generate even more revenue, which… well, you get the picture, and that not-so-vicious circle is now in motion for the A-League. The Del Piero versus Heskey sub-plot was the reason I went to the game, but that obviously won’t be repeated unless the two teams meet in the finals. However, Del Piero himself did enough to pique my interest in attending another match during the season. Does two games qualify me as an A-League fan? Perhaps not, but it is two more games than I attended last year. Or ever.